We are offering HDPE Scraps, derived from typical household un-colored Milk Bottles, which are collected in residential re-cycling programmes. These bottles are not herbicides or pesticide treated, thus, the HDPE Milk Bottle Scrap is of pure quality. 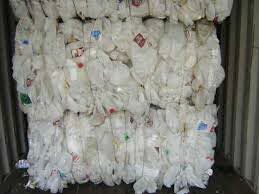 We are a noted HDPE Milk Bottle Scrap Exporter and Supplier from Thailand. We make them available in retails as well as bulk quantities. Also, we can ensure safe and timely delivery of our product. Contact us for placing orders.